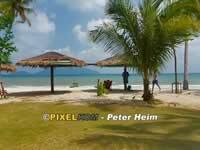 Virtual Travel & Island Guide about Klong Kloi Bay on Ko Chang in Thailand. Klong Kloi Bay (Aow Khlong Kloi), also written Khlong Kloi Bay or Khlong Khloi Bay, is a long drawn-out bay approximately 2 kilometres east of Bang Bao Bay (Aow Bang Bao) - have a look at the map: just click the Ko Chang logo top left. 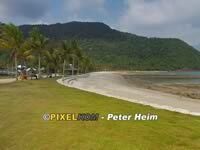 The bay domiciles a very beautiful, roughly 1 kilometre long sandy beach lined with palms. 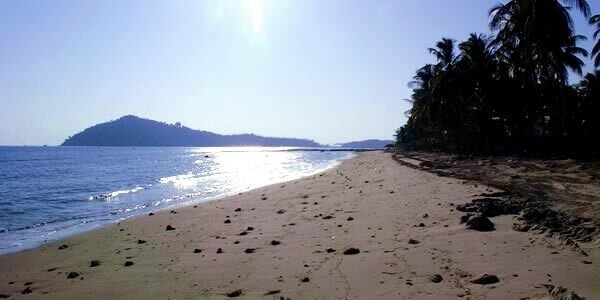 The Klong Kloi Beach is flat but only the northern part is stony. At low tide the beach draws way back but in the southern part it's easy to get to the deeper water even at low water level. Also here you'll find a few resorts that can be booked via the link below. Klong Kloi Bay cannot be reached by public taxis but for some extra money you'll find drivers that will bring you to Klong Kloy Bay. The more persistent may drive with a rented motorbike or car to the end of the road and have to pay an entrance fee (in 2008 it was 150 Baht) to have a look at the located luxury resort. 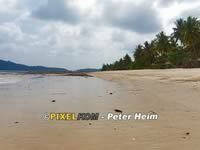 The beach is also reachable by foot from Baan Bang Bao as well as by private boat.